Feature: Anime's equivalent of Mad Max with skull exploding martial arts has been remade into a very slick update to the existing series. My first encounter with Fist OF The North Star was the old Sega Mega Drive game called Last Battle, then later with the English translation of the manga series by Viz. I always liked the property and thought it never really took off as much as I thought it should in the west. I Hope this serves as a great start to get some more fans in the west, especially with the ever increasing popularity of anime. 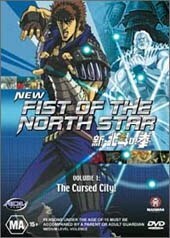 Fist Of The North Star (FOTNS) is a great series of stories that are somewhere between Lone Wolf and Cub and Mad Max, involving lots of post apocalyptic action mixed with some completely out of control martial arts violence. This new story has Kenshiro, a lone warrior who wanders the bleak landscape of the future, helping its poor inhabitants who are ravaged by disease and harassed by gangs. It's nothing particularly new, but it makes for some classic FOTNS action. That's what really sold me on this, as it keeps the art style and feel from the original stories while updating it with lots of great new effects that modern animation is capable of. Volume one: The Cursed City has Kenshiro helping out the Village of Freedom who are desperately in need of uncontaminated water. The Last Land Kingdom are controlling the area with an iron fist and are killing the locals like there's no tomorrow. Tobi ( a man who sells "information") finds the villagers an underwater spring. As soon as Tobi shows them the spring, a garrison from the Last Land turn up on dirt bikes and in jeeps and claims it in their name. Cue Kenshiro, who just happens to be in the area, who gives the garrison a right seeing to. Tobi gets injured in the fight and Kenshiro takes him to a local healer,... with skills not unlike his own. The story continues on its merry way, not getting bogged down, and not going for more than a few minutes without some more head popping action. The simple good versus evil plot could have been torn from any western or sci-fi story involving an oppressive government and a powerful individual who stands up for the little guy, but it works great. For anime, it keeps very uncomplicated and doesn't get (dare I say it) boring like a lot of anime that tries to overcomplicate a simple story, but that's just my opinion. It really keeps its "old school" anime/manga heritage and like classic 80s style action movies, they just don't come along that often these days. This is a great start to this three part series and I hope it keeps up the pace for the remaining two episodes. Beware though, there is some very explicit violence and gore, and some of the sequences are not for the faint of heart. Video: Although its a 16:9 feature the picture isn't enhanced and remains letterboxed, which is a tad disappointing in this day and age. On the other hand most anime produced these days is 4:3, so its not really a big issue, still, a true 16:9 picture would have been nice. The picture is, however, completely flawless. This is a great expononent of how clean modern animation can look, with not artefacts or interlacing issues at all. There's quite a lot of CG in this and it merges seamlessly with the traditional animation. Its a fantastic looking picture and really shows off the great design work and production. Audio: Another surprise was that FOTNS was in 5.1 Dolby Digital, in both the Japanese and English tracks. Both tracks are great and create quite an immersive experience. I would say the rear channels were a little loud, but that's not a great problem which can be easily fixed with your remote on most 5.1 systems. There's a lot of positional effects and some nice low end. The dialogue stays crisp and clean, and the English track, although still inferior to the Japanese one, does a good job without getting too cheesy. Special Features: I was surprised there were any extras at all on this disc, but what's here was worth inclusion. There's a thirty minute long interview with the leads of the English voice talent that stays informative, without getting too dry and boring. A nice inclusion in the extras was an Interview with Relson Gracie, of the world famous Gracie Family; who are incredible jiu jitsu martial artists. He explains the principles of the fighting style, and how the pressure points work in combat. This is quite informative and entertaining. Lastly there is an interview with the Japanese creators of the project at a press conference for the release. This gives a nice insight into what they wanted to do with the franchise and shows the respect and love they have for the original story. Some trailers and promo stuff rounds out the extras, in usual ADV fashion. Final Say: An excellent start to the series and great ride for anyone into the more visceral side of anime. The action is fantastic as is the extreme violence. This may not be for everyone however as it pulls no punches in the gore department. Fantastic presentation in video and sound make this a great opening to what I hope will develop into a must-have trilogy.